Added on June 22, 2009 by Chris Saad. Over the past few weeks and months some in the DataPortability Project (Specifically the Governance Taskforce) has been intently focused on designing a new type of governance model. A model that borrows from Robert's Rules and adapts it to a time-shifted, asynchronous, distributed and global organization. The participants in this effort, I believe, are performing historic work to crystallize and codify the ideals of the founders (and by extension the community) of the DataPortability project whereby the goals of openness and transparency are built into the way our community operates and makes decisions. The careful balancing act of advocating and supporting open standards, encouraging democratic community participation and adopting the support of major vendors has been difficult to say the least. Indeed we have failed on more than one occasion. But the continued perseverance of the project leaders has been a testament to their commitment to the cause. Not just to promote data portability - but to engineer a new type of organization - one that broadens the reach, scale, tone and tempo of the conversation. Each of these stages in the groups growth has been an organic evolution as the project has found its place, purpose and people. As the new governance model takes affect and the new steering group forms we will finally be in a position to continue the organic growth of the project. While it has been a real pleasure to help create and shepherd the group during its incubation - it has always been our intention as founders (at least since the explosive growth of the group) to constantly and organically hand over control and accountability to the community. The next logical step is to apply the governance model to elect a chairperson. I look forward to that conversation when it comes - and having the community (via whatever means comes to pass) choose a person to lead the project. I will continue as interim chairperson until the role is filled by the selection process. While I have loved filling in while the project has grown I think the time is right for another member of the community to step in and take the project through the next phase of development. Therefore, I, myself, won't be running for the role. I will, however, continue to be heavily involved with the project and participate as part of the community how ever and when ever I can. We will continue to keep everyone updated through the mailing lists and blogs as to our progress. In the mean time, however, the conversation about data portability itself continues both inside and outside the project and we continue to support it however we can. There is talk of conferences, meetups, possible taskforces (based on the new governance model) and more. Stay tuned! Also, and perhaps most importantly, I'd like to send a heart felt thank you to the leaders of the governance conversation including Elias Bizannes, Trent Adams, Brett Mcdowell, Steve Greenberg, Brady Brim-Deforest and Mike Smith. You guys are amazing. Added on June 18, 2009 by Chris Saad. 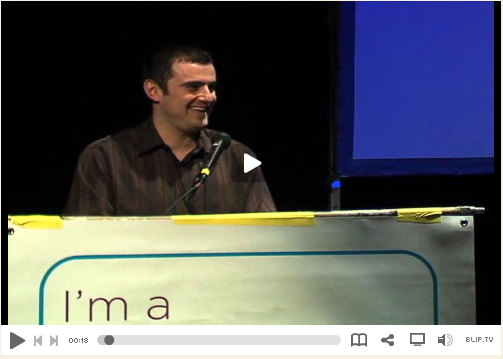 When I heard about Gary Vee's talk at #140conf was titled 'Scaling Caring' I though "Seriously? That's stupid". I just watched the video. I was wrong. Maybe in the wrong hands that could have been a stupid talk, but in Gary's hands it, like everything else he does, was a fun, insightful and earnest attempt to open people's eyes to what's in front of them. The talk actually touches on what Jeremiah and I were blogging about recently. Jeremiah had asked the question 'Can people scale along with Social Media'. In other words, can you really keep up with all these incoming messages while remaining authentic and doing a real level of caring. My response was no, you can't. And you shouldn't try. Social Media is actually Personal Media and it's not about talking to everyone who sends you a message - it's about being authentic and staying in touch with friends and things that interest you. Gary has highlighted another type of Scale though - one that Jeremiah and I missed. One that is obvious to some but all too often missed by many. Gary's point was that brands (personal or corporate) should pay attention to the once private and now very public, searchable and archive-able word of mouth that is happening at breakneck pace across the web today. You should care about every single mention and react, respond and resolve every single mention of your brand. I wasn't going to write a post on this - it was just a passing thought - and then I got a PayPal customer satisfaction survey in my inbox. Really? Do you really need to run a survey to know what I'm thinking? Why don't you just tune into my Twitter feed? Does PayPal listen to Twitter? I don't know. Do they respond? Doesn't seem so. Their @PayPal account seems to be just re-posting news highlights. Maybe they are - I don't have time to do any thorough research on this specific case, but it did tip me over the edge to post. Gary Vee is making a fundamental point that we've all made in the short history of this new media ecosystem - but as usual his delivery style makes all the difference. This theme especially resonates with me with my recent work at JS-Kit. We (the strategy team) often talk about support as a killer feature. We try to respond to every blog post and twitter message about our service to let customers know we care. But more than that, we actually care. We don't just respond, we factor it into our decision making. I'm sure this isn't unique, but it is far from pervasive - especially outside the web industry - and it should be. We also spend a lot of time thinking about how a tool like JS-Kit Comments might facilitate more scalable caring. How can a site owner or a participant/user keep track of their audience or their friends in all the social media noise? The answers are still being formulated - but rest assured I will keep an ear out for the clear and resounding feedback - not with a survey, but by tuning into the ongoing, searchable and archivable conversation. Added on February 27, 2009 by Chris Saad. Today the Media 2.0 Best Practices went live. I'm very happy to see this come to light. I've been working on something like it for a number of years now, and with JS-Kit's backing and the participation of my friends it has taken shape. I'd like to thank all involved. I look forward to having conversations with the participants and creating something that vendors can use to make and keep user-centric promises to their participants. I'm also very happy that the Media 2.0 Workgroup was able to take on this process and see it through. There is a lot of potential in that group that is yet to be realized. Added on January 12, 2009 by Chris Saad. I have just published a post about "Peered Data Portability" on the official DataPortability Blog. While the post deals with open standards and software architectures it's actually about business. How much is the social networking aspects of your web-based properties worth to you? If you are a major media property (CNN, BBC, Fox etc), a provider of digital services to large brands (Ford, Amex, Coke etc) or a large blog/website how comfortable are you with outsourcing a major part of your core value to a single, central social networking node (In my example it was Facebook). Major companies across the world are starting to realize that to remain 'in the game' on social networking specifically and the web in general it's critical that a peered model for data portability emerges. Added on November 29, 2008 by Chris Saad. One of those commands could be 'd tag last' which ques up the last @reply in some sort of 'follow up' queue for the bot owners. Can you think of any other features? Add them in comments and if I like them I will append them here!